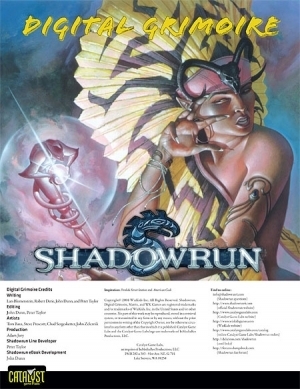 We released our first small, PDF-only project for Shadowrun on Friday; an 18-page supplement that offers some magical expansions, new traditions, spells, adept powers, magical groups, etc. It’s an interesting little book, and a fun experiment … I wrote the BCC text to be quite explicit about what you get with the book, so people don’t buy it expecting a dozen magical groups; nope, there are three, and the BCC tells you exactly which three. I think that’s the correct way to handle short projects like this. I think four bucks is an awesome price — if you use *one* thing in the PDF a few times in your game, you have your money’s worth. Compared to some PDF books that are two bucks for 4-6 pages, we might actually be a little underpriced, but we’ll see how things shake out during the experiment. Got back to Seattle last night from the GAMA Trade Show. We had a good time in Vegas, and a very productive show for Catalyst Game Labs — we heard a lot of good things about our current product lines, and a very positive response to the new games that we’ll be releasing later this year. I’m in meetings for the next couple days, and I didn’t get as much of a chance as I would have liked to wander the show floor, but I’ll probably post a bit more about the show soon-ish.